Lorne is a coastal resort town on the Great Ocean Road, 120 km south-west of Melbourne, situated in what is described as a tree clad amphitheatre, below the Otway State Forest. It is between Aireys Inlet and Apollo Bay. Although separated from the Western District pastoral areas by the Otway Ranges, a small pastoral holding was established there in 1852. The Mountjoy family acquired the run in 1874 and built a permanent homestead. Known as Loutitt Bay, the area had the appeal of tree fern gullies, the Erskine River and falls, the river estuary and a beach. In 1868 the Mountjoys opened a guest house for the increasing numbers of visitors. 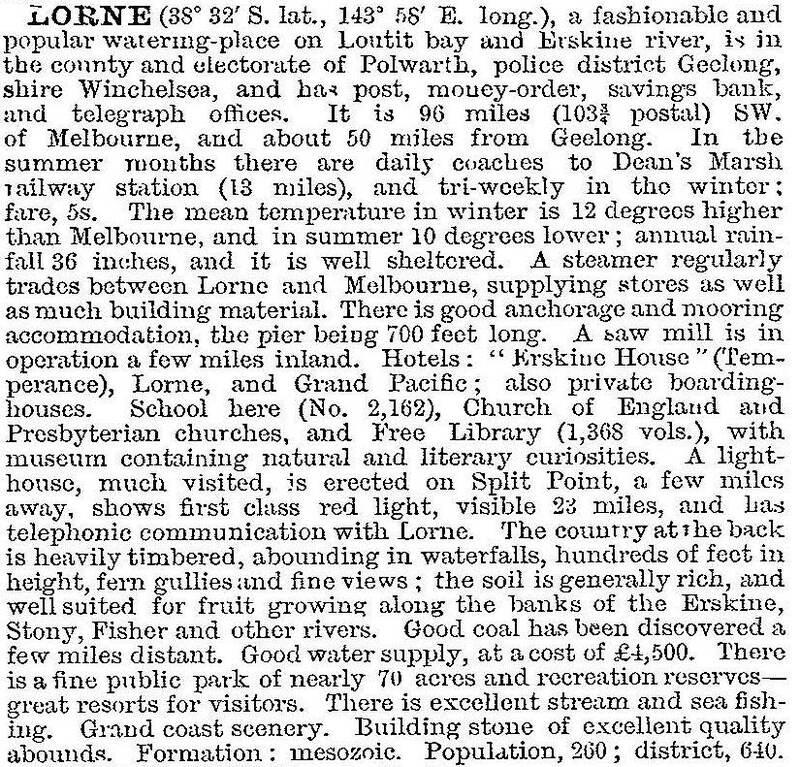 The following year a town was surveyed, and named Lorne in honour of the Marquis of Lorne, the husband of Princess Louise, a daughter of Queen Victoria. A road from Deans Marsh to Lorne was built in 1872. Erskine House, the grand Pacific Hotel and the Lorne Hotel were built by 1878. Lorne’s mixed farming and tourist economy brought a population approaching 150 people. A school and an Anglican church were opened in 1879 and 1880, and a draper and general store were also opened in 1879. A water supply basin supplied by the Erskine River was constructed in 1889. Throughout this time, and until the building of the Great Ocean Road as far as Lorne in 1922, access to Lorne was by railway to Deans Marsh and by coach over the Otways. Lorne is the only part of the Australian coastline where blue gums grow practically to the water’s edge. Fringing Louttit Bay, the gums sway gracefully in the breeze and form natural archways that enhance the beauty of the views across the glamorous blue waters of the Bay. Possessing a mild equable climate 10 degrees warmer than Melbourne in the winter, Lorne attracts annually a large number of visitors. A holiday at the queen of Victorian watering places is pleasurable at any period of the year. Spacious, modern accommodation with moderate tariff rates is one of Lorne’s many attributes. There are two hotels and eleven guest houses. Tennis courts, bowling greens, croquet lawns and putting greens, in addition to the surfing and walking, fulfil the highest expectations of pleasure-seekers. Lorne’s census population doubled between the mid-1930s and 1947. The shortages of petrol and motor transport brought a rail and bus tour heyday for Lorne and its guesthouses, but the changes to wider car ownership and motel type accommodation drew away patronage. The provision of camping and caravan grounds brought different crowds. Surfing’s popularity grew along the coast from Torquay to Lorne, and Lorne became renowned for boisterous beach side behaviour on New Year’s Eves. By the 1980s seven guest houses were closed, leaving only Erskine House and the Chalet. Tracks to some waterfalls on the five streams which empty near Lorne were closed. In 1984 a Colac property developer, David Marriner, acquired the Cumberland guest house. He advocated a change in accommodation styles if conservative Lorne were to at least maintain, let alone advance, its local economy. Multi-storey time share units were built on the Cumberland and adjoining sites, despite local resistance which considered the development an intrusion in the tree lined amphitheatre. Lorne has a linear coast-wise shape, with over 1400 weekend and holiday houses, some elaborately proportioned and about 500 permanent houses at the 2011 census. The retail area is in Mountjoy Parade. Caravan parks flank the Erskine River, and the long foreshore reserve includes a caravan park south of the town. The school has advanced from a higher elementary school (1950) to a P-12 college, with 322 pupils in 2014. There are a golf course, bowling club (both 1954), swimming pool and tennis courts. The hospital includes elderly persons’ accommodation. Lorne Historical Society and the Surf Coast Council promote an awareness of Lorne’s surviving heritage, its natural features and the rapidly advancing changes. Registered historic buildings include the higher-elementary school (1879, 1908), the cinema (1957) and the weatherboard Uniting church (1892). Numerous motels, bed and breakfasts, restaurants and a tourist information centre cater to visitors. The annual 1.2 km Pier to Pub swim (1980) is held each January. Like other towns on the Great Ocean Road Surf's Coast, Lorne is a popular destination for schoolies celebrations. In 2011 the median age of residents was 50 years (Australia, 37 years). Employment in accommodation, cafes and food services accounted for 19.8% of all employment at the 2011 census.